You Are Listening To "Blue Spanish Eyes"
It is a small town of about 7,000 people, western in style and at an elevation of 4,260 feet. Truth or Consequences is well known primarily for its unusual name. It was formerly known as Hot Springs. Pictured above is the Chamber of Commerce and Visitor's Center. We are now in Lake Caballo State Park. (pronounced Ka-bah'-yo) The Caballo Mountains provide a dramatic backdrop to the lake which boasts an array of watersports, waterfowl and cactus gardens in bloom. The park's claim to fame are the majestic Bald and Golden eagles that migrate to Lake Caballo. 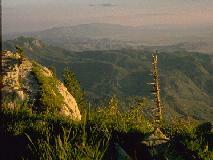 Numerous Golden Eagles nest in the nearby Caballo foothills, while the Bald Eagles prefer higher ground in the mountains. Fishing here will yield large mouth bass, walleye, white bass, bluegill, pike and an occasional rainbow trout. Too bad we didn't bring any fishing gear this trip. Let's keep the Chevy going and see where it winds up next. This monument offers a glimpse of the homes and lives of the Mogollon culture who lived here from the 1280's to the early 1300's. 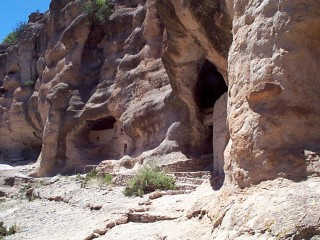 The Gila Cliff dwellings (pronounced Hee'-lah) are surrounded by the Gila National Forest. 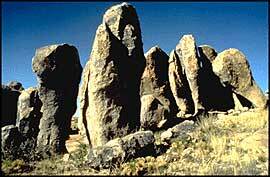 They probably look much as they did when these early Native Americans dwelt there. 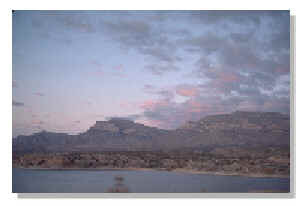 It contains 533 acres and was established as a National Monument in 1907. 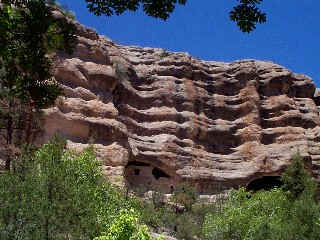 The cliff dwellers took advantage of the large, natural caves and built two-story dwellings with the available natural materials. We're now going to head north (hey, Joe, north...you're going south...that's right) toward Albuquerque. Albuquerque is a magnificent combination of very old and highly contemporary. It's a city with a rich history. Estimated age of bones found in Sandia Mountain is 10,000 years. This is the view from Sandia Mountain. 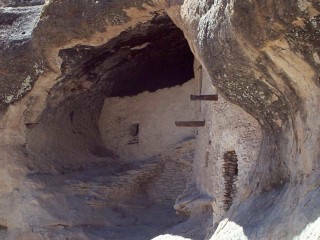 The Anasazi Indians were the last to settle in the area and lived here for two centuries, from 1100 to 1300. 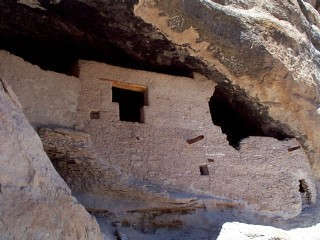 The Anasazi were probably the first identifiable inhabitants of the southwest. They have bestowed upon us a breathtaking legacy of cliff dwellings and traditional crafts. 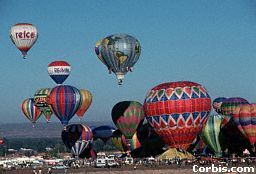 From a small gathering of 13 balloons in 1972, the Balloon Fiesta has grown to become the largest balloon event in the world with more than 900 balloons painting the skies over Albuquerque the first week in October. Your spirits will rise to meet the clouds when you see hundreds of hot air balloons defy the pull of the earth. Oh, there's so much more to see in Albuquerque, but we're off for a short drive to Santa Fe. You know the routine...click on the license plate and let's go see New Mexico's Capital city.